See Application Instructions for eligibility and other details. IIR Grants are APSF’s primary grant program that supports research directed towards enhancing anesthesia patient safety. Potential areas of research include a wide variety of patient safety topics. Grants may be awarded up to $150,000 for a maximum period of 2 years. Grants are made out to the sponsoring institution. In honor of APSF founder, Ellison “Jeep” Pierce, and his commitment to anesthesia patient safety, this annual prize is awarded to the highest ranked IIR grant every year. This $5000 award goes to the institution under the name of the Principal Investigator and is for unrestricted use. SSCDA are training grants awarded every one to two years to develop the next generation of patient safety scientists. This award is for up to $75,000 per year for a period of 2 years ($150,000 total), and includes a career development component and a mentored research project. Grants are made out to the sponsoring institution. This award is selected annually at the ASA Annual Meeting on October for the best abstract in patient safety. 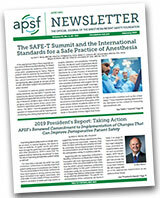 The APSF Committee on Education and Training, under the direction of APSF leadership, announces the third annual and expanded APSF Trainee Quality Improvement Program. The 2019 program hosts tracts for resident physician anesthesiologists, student registered nurse anesthetists and anesthesiologist assistant graduate students. THE DEADLINE FOR THIS PROGRAM HAS BEEN EXTENDED TO AUGUST 31, 2019. APSF invites all US and Canadian anesthesia professions in training to demonstrate their program’s work in patient safety and QI initiatives. The top two projects in each tract will receive APSF recognition and financial rewards.